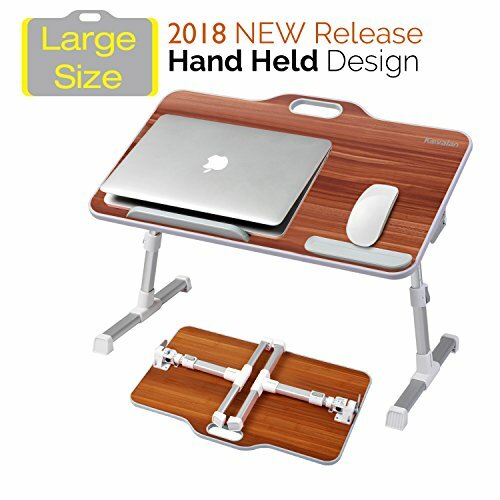 Kavalan Multifunction Adjustable Laptop Table is an ideal desk for the different application, no matter to be used on Sofa/Couch, Bed, Desktop or Floor. It can be a reading desk, kid table or even a sit and stand desk for work. With the opening handle/folded legs, it's just easy to carry anywhere to fulfill what you need. It's not a desk but bring lots of joys for your life! -Easy Adjustable 5 Height Positions from 9.4" to 12.6"
-Lift two clamp latches on each side at the bottom of the table and set the table to the desired angle as illustrated. Press down the auto-lock Clamp Latches" to fix the table for a comfortable vision angle. -Height Adjustment: 9.4" to 12.6"
If you have any questions about this product by Kavalan, contact us by completing and submitting the form below. If you are looking for a specif part number, please include it with your message.